The Circus Bee (March). Composed by Henry Fillmore (1881-1958). 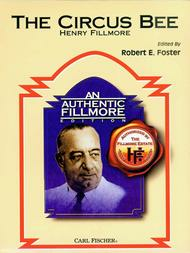 Edited by Robert E. Foster. Concert Band. For Flute, Piccolo, Oboe I, Oboe II, Clarinet I, Clarinet II, Clarinet III, Bass Clarinet, Bassoon, Alto Saxophone I, Alto Saxophone II, Tenor Saxophone, Baritone Saxophone, Trumpet I, Trumpet II, Trumpet III, Trumpet IV, Horn I, Horn II, Horn III, Horn IV, T. Henry Fillmore Band Series (An Authentic Fillmore Edition). Classical. Score and Set of Parts. Standard notation. 24 pages. Published by Carl Fischer (CF.CB125).ISBN 0825851114. With Standard notation. classical.